Nose is a sensory organ which is made up of the framework of bones and cartilages. It is lined with the skin from the outside and on the inside by a highly specialized olfactory mucosa which is responsible for the receptive to the scents and odors. There is a large cartilage present inside the nose which provides shape to the nose; this is called the nasal septum or septal cartilage which divides the nasal cavity into two parts- the anterior part which is also called as a nasal vestibule and posterior part also called as choana (internal nostrils). It is a well-known fact that the nose that it is a passage for the air; it humidifies the inspired air and makes it warm. The major function of the nose is olfaction. This is the normal physiology of the nose but whenever there is any alteration in the normal physiology, the function of the nose is disturbed. This can be present in case of nasal vestibulitis which is caused by staphylococcus bacteria. This diseases when appears presents with white spots inside the nose along with redness, swelling and tenderness. For such complaints of white spots in the nose, patients must consult a doctor to know how to get off it. 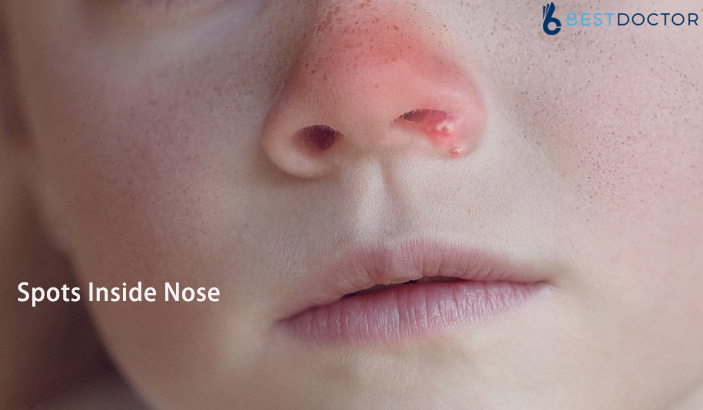 This article will help you to know what can be the possible reasons for the spots inside the nose along with treatment. This is a bacterial infection of the nasal vestibule, which is an area inside the nostrils. It is also called folliculitis. Nasal vestibulitis is medical terminology for a pimple inside the nose. Nasal vestibulitis can occur due to multiple reasons which cause staphylococcus bacteria to proliferate and formation of pus. Diagnosis is mostly done by physical examination which helps the doctor to view white spots inside the nose. To rule out other associated diseases various tests including blood investigations or CT scan or MRI may also be advised if the infection is spread to adjacent sinuses. Fluid aspiration from the infected part may have to be done to know the causative agent so that medications can be started accordingly. What signs and symptoms observed first? Any abnormal discharge if present. Patients often opt for home remedies for managing nasal vestibulitis. However, antibiotics may also have to be given depending upon the nature and severity of the infection. It is the acute condition caused by localized bacterial infection of a hair follicle inside the nasal cavity. It is also called a nasal boil. Abscess formation and Cavernous sinus thrombosis are common complications of nasal furunculosis. Treatment involved is generally conservative which include hot fomentation. For pain, analgesics are given and antibiotics may also be prescribed. This occurs when the hairs which are present inside the nose are pulled out which leads to the formation of a cyst at the site of hair follicle inside the nose. A cyst is a fluid filled cavity. But when the cyst gets infected, it produces pain and discomfort. If it is left untreated, in-grown hair cyst may worsen and continue to form an abscess. On examination, the ingrown hair cyst appears as white spots inside the nose. Treatment is generally conservative and can be managed with the help of anti-inflammatory and antibiotic medications. Most of the nasal conditions mentioned above which may lead to white spots inside the nose; tend to recur in spite of receiving timely attention and treatment. Whenever you notice any abnormality within the nasal cavity such as unusual white spots, it must be reported immediately to the doctor since white spots inside the nose can range from conditions as minute as a pimple to something major like an ingrown hair cyst or an abscess. These conditions are not just painful, but also disabling enough to disrupt a person’s routine. Ignorance minor illnesses problem always tend to lead to the complications in the future. For this reason, it is important to visit the doctor to receive accurate diagnosis and treatment for the conditions leading to white spots inside the nose. Next PostWhen To Go To Doctor For Spider Bite?